Weapons can have different attributes as tags. And basically what your imagination can do with tags. 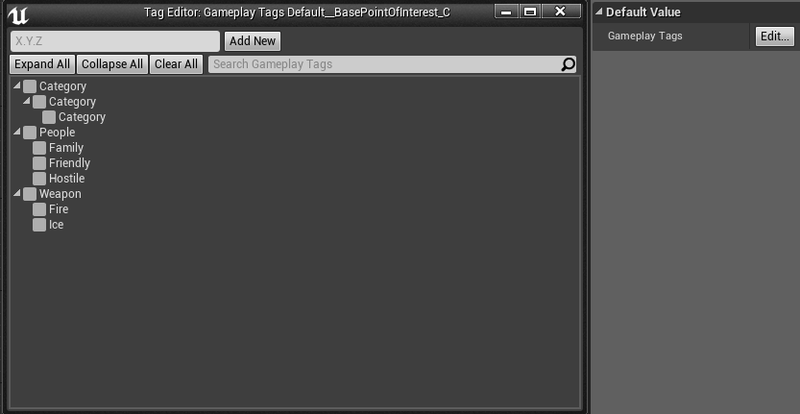 Basically tags are used to filter some data in games, but you can do lot more with them. The main different is that actor can have multiple tags, doing the same with ENUMS is doable but won’t be user-friendly. Another thing is that you don’t need to cast for specific actor. For example you want to find all enemies that can be damaged by fire damage with some radius. You can just check their (Actors) tags without casting. Or you want to check if actor have inventory. Just find component by tag – if it’s there it means that this actor have inventory. Simple as that. 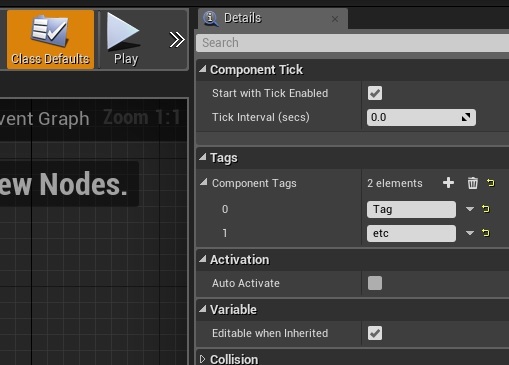 UE4 have two Tag systems: Actor/Component Tag and GameplayTags. 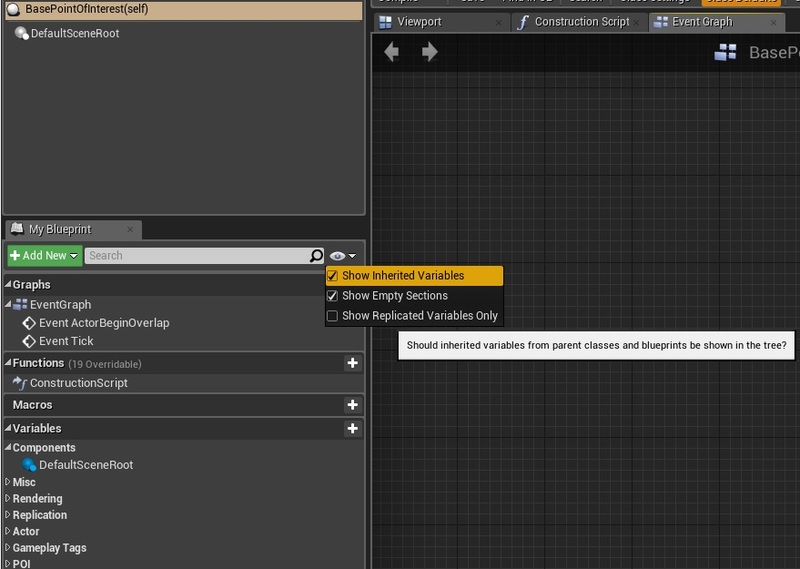 The first one is known from UE3 and it doesn’t support categories or editor out of the box. GameplayTags in the other hand is new system that isn’t enabled by default but it’s working. It supports categories have editor and comes with more functionalities out of the box. As you can see it’s just array with names. Currently it’s only visible as array – without GameplayTag editor (which you will see later in this tutorial) but I think Epic will add editor here as well. Tags themselves are very generic and can be used for a lot of different things. The basic idea is that they are strings with a hierarchical relationship. E.g., they can have a parent. An example tag would be “A.B.C” or “Damage.Physical.Pierce”. 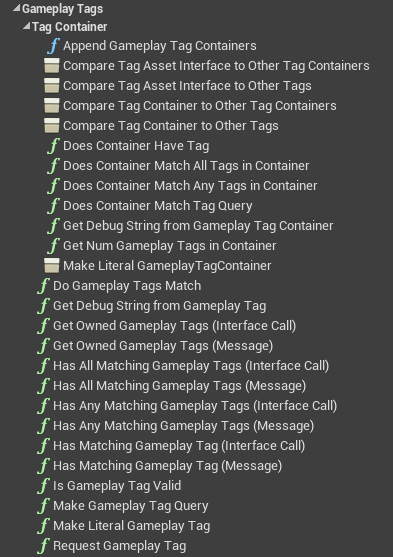 That is really all tags are themselves. They hold no other data on their own. GameplayTags can be used only in C++ for now. Your class need to implement interface and have special variable. Then you can add tags in editor – no coding is required. Add new Actor C++ class using “New C++ Class…” option. Then close editor. To use GameplayTags you need to add module into your ProjectName.Build.cs file which is located in /Source folder. Next step is to add gameplay tag interface. Your actor need to implement IGameplayTagAssetInterface. As you can see my class is extending ACharacter and IGameplayTagAssetInterface. Thanks to that I’m able to use function to get my tags variable. Thanks to this GameplayTag system will be aware of tags stored in this Actor. Compile and open Editor. Create Blueprint extending from your c++ class and open it. Now you can see GameplayTags category and GameplayTags variable! If you click Edit GameplayTag editor will be opened. Those are from Project Settings -> Gameplay Tags. You can add tags from here as well – they will be added to global gameplay tags. That’s really cool and simple to use. And they are much easier and faster to work with. Nice tutorial mate! Exactly what I was looking for. You might want to mention people need to include.. Thanks for your tutorial , I want to ask please create an example for calling a function in C++ and pass some Gameplay Tags from C++ into that function not from BP.